Oil Dome Cruiser Hand Pipe. 6". 1ct. .. Double Chamber UFO Perk 14mm Oil Rig. 14mm Dome And Nail Included. 10". 1ct. ..
Krave Glass Honeycomb Frit 14mm Oil Rig. 14mm Dome And Nail Included. 10". 1ct. ..
Mason Jar Style Showerhead 14mm Oil Rig Water Pipe. Dome And Nail Included. 10". 1ct. ..
Molecular Diffuser Perk 14mm Oil Rig. 14mm Dome And Nail Included. 10". 1ct. ..
Mr Toadz Wild Honeycomb 14mm Oil Rig. 14mm Dome And Nail Included. 10". 1ct. ..
Reversal Art Inline 19mm Oil Rig Water Pipe. 19mm Dome And Nail Included. 10". 1ct. ..
Sprinkler Perk Round Tube 14mm Oil Rig. 14mm Dome And Nail Included. 10". 1ct. .. The Big Dipper 19mm Oil Rig Water Pipe. 19mm Dome And Nail Included. 10". 1ct. 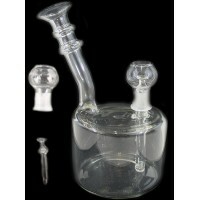 ..
Thermo Swiss Perc Scientific Recycler 14mm Water Pipe. 14mm Dome And Nail Included. 10". 1ct. Not.. Double Molecular Perk 14mm Oil Rig. 14mm Dome and Nail Included. 11". 1ct. ..
Showerhead Honeycomb Vase 14mm Oil Rig Water Pipe. 14mm Dome And Nail Included. 11". 1ct. ..
Skull Perk 19mm Oil Rig Water Pipe. 19mm Dome And Nail Included. 11". 1ct. ..
Vortex Barrel Perk 14mm Oil Rig. 11". 14mm Dome And Nail Included. 11". 1ct. ..